I recently got to spend a few days with my first culinary partner in crime. As university housemates, Karen and I shared a strong enthusiasm for procrastination by cooking, always accompanied by many cups of tea. Being in the kitchen with her this spring brought back so many delicious memories and inspired a number of the recipes I have posted lately, including this delightful dessert. Brightly coloured, tangy flavoured lemon curd is sandwiched between delicate, flaky pastry layers to make perfect little bites that would be ideal for a tea party or as a light dessert after a big meal. The puffs can be baked ahead of time but should be served within an hour of filling. Not quite a cookie, not quite a pie…these little beauties are hard to classify, but easy to make and oh so pretty! 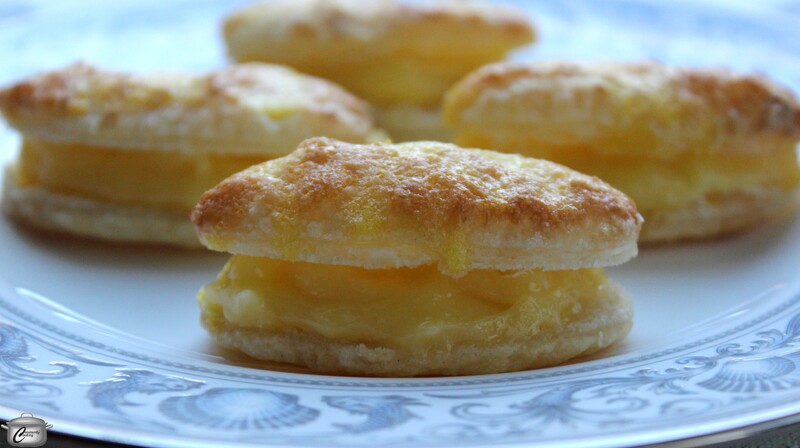 Flaky pastry and a layer of tangy lemon curd make these lemon puffs the perfect little bite-sized desserts. Preheat the oven to 400F. Line two baking sheets with parchment paper and set aside. Zest lemons, putting zest in a small bowl. Dust your countertop lightly with icing sugar. Divide puff pastry into two equal portions and roll each one out to an 8 inch (20 cm) square. Mix the reserved lemon zest with 2 tablespoons (28 g) superfine sugar and sprinkle over each sheet of puff pastry. Carefully lift one of the sheets and place it on top of the other, with both sugared sides facing up. Continue rolling out the stacked pastry so it almost doubles in size (your goal is to have a square that is approximately 14 inches (35 cm). With a 2” (5 cm) round pastry cutter (use a drinking glass if you don’t have a cutter), cut out 24 circles in the dough (you may be able to cut more than this if you’re careful). Transfer the cut circles to the lined baking sheets, spacing them about 1 inch (2.5 cm) apart. Lightly prick the tops of each circle several times with a fork. Bake in the preheated oven for 8 minutes; they should puff up and turn light brown. While the puffs are baking, whisk together the egg yolk and remaining 1 tablespoon (15 mL) sugar. After the puffs have baked for 8 minutes, brush the top of each one with the egg yolk mixture and return the trays to the oven for a further 3-4 minutes until crisp and golden, but watch them carefully to be sure they do not burn. Split the cooled pastries in half with a sharp knife and slather the lemon curd in the centre, sandwiching the halves back together. This entry was posted in Baking, Desserts and tagged baking, dessert, egg, lemon, lemon curd, puff pastry, puffs, sugar. Bookmark the permalink.